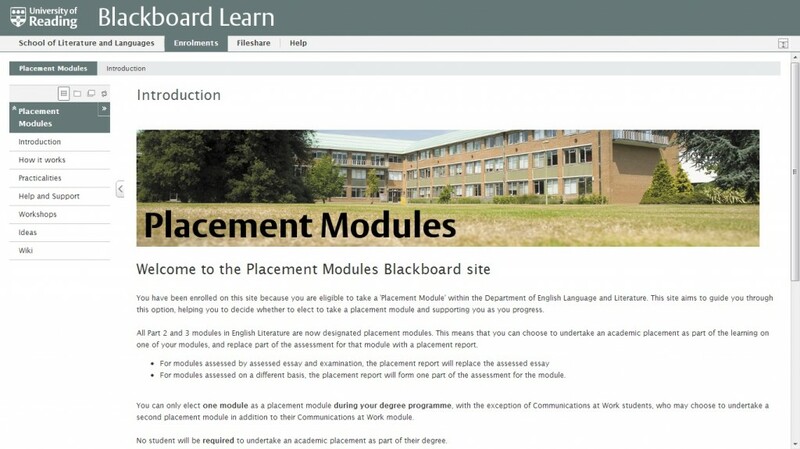 I have been involved in the Digitally Ready project here at Reading since June 2012, working with Dr. Lucinda (Cindy) Becker, Placement Tutor in the Department of English Language and Literature, to improve the information available to English Literature students about academic placements. It is possible (and in fact encouraged) for students of any degree programme to complete a placement as part of their studies, but there is just not enough information available, so many students are unaware of this opportunity. We were looking at a current offering of a Blackboard VLE site, so I started by looking through this and discussing with Cindy what exactly it was she wanted to achieve. My brief was essentially to improve the technical offering available, so we had to focus this down to some key areas. Cindy regularly attends a Teaching & Learning events run at the University and is very enthusiastic and proactive in initiatives to improve things for students. One of her ideas for the site was to set up a wiki, so that when students had queries about doing placement modules then not only her, but also other students, could give their input in answering the question. This seemed like a great way of engaging students and getting some useful feedback – in some cases students can answer questions which staff have less experience with, e.g. what it is like to do a placement for a specific company. This meant that setting up a wiki was definitely on our task list. However the wiki alone was not enough and I was also keen to make the whole site as useable as possible. 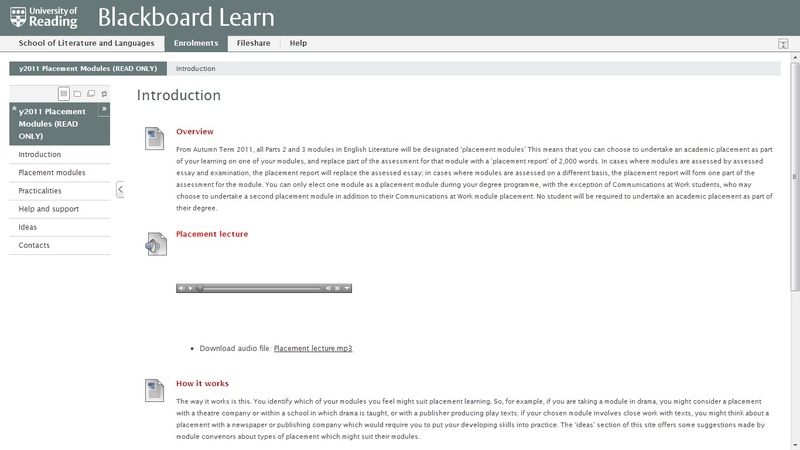 The previous design was a little fiddly and based on the ‘content areas’ in Blackboard – these offer a wide range of functionality, but aren’t exactly the nicest thing to look at. Therefore my other task was to work on redesigning some of the current content and using some of the nicer looking Blackboard page designs to make the site the best it could be. What we now have is something we can really be proud of. The use of banner images at the top of each page makes a huge difference to the appearance of the site and using photos from around the university makes it more personalised for Reading students. After all, we’re trying to offer something different and they can now see the wonderful Whiteknights campus when they log onto Blackboard. You can see the difference it makes in the before and after comparison. Dropbox – used to keep everything securely backed up and to almost instantly share files over long distances. The challenge with this project was presenting detailed information about a fairly complex topic in a clear and straightforward way. If we had gone outside of Blackboard and come up with our own solution, we might have been able to do this even better, however this would lose the convenience and familiarity of Blackboard, which students can use with their existing IT login credentials. It really helped that I have a background in IT from having an interest in it and working in the University’s IT Services department. From working with Cindy and Nadja Guggi from the Digitally Ready team I have learnt how to use the Blackboard VLE, how to present content in the best way to students and have discovered a number of ways to work as a team despite different locations. I believe the updated site will benefit students and has made the information more easily accessible than before. While Blackboard can be difficult to work with at times, it really doesn’t deserve all the bad press. Sure it may seem fiddly to use, but actually it makes it quite easy to upload documents and write pages – if we tried to do this without a Content Management System it would be near impossible. From working on this project I have learnt a lot about how to use it and have uncovered some of its features above a standard webpage and file upload. It is definitely something which can be and will have to be put to better use in the university – as a key part of designing a module and an integral part of the learning experience. This entry was posted in Small project funding scheme, Staff-student partnerships, Work/Academic placements and tagged Blackboard (VLE), CampusPack, Centre for the Development of Teaching & Learning (CDoTL), Cindy Becker, Content Management System, Content Management System (CMS), Dropbox, GIMP, Nadja Guggi, School of Literature and Languages, Simon Hyslop, Wikis. Bookmark the permalink. Congrats Simon, looks like you’re doing a lot of useful work out there. Hope the placement has gone well for you.